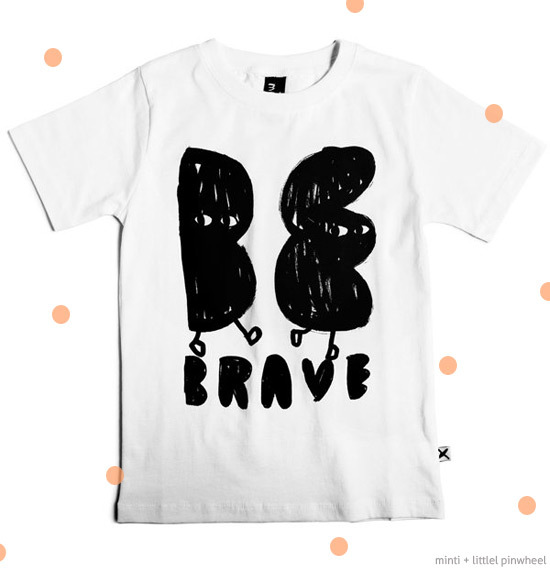 Little Pinwheel owner and all-round good gal Hayley Blease has collaborated with Melbourne kids' label MINTI to create this Be Brave tshirt. 100% of proceeds of the tee will go to Bravehearts Inc - which aims to empower, educate and protect children by providing healing and support, engendering child sexual assault prevention and protection strategies; advocating for understanding and promoting increased education and research for child protection. Hayley will also be running seven marathons in seven states in seven days with a goal to raise $25,000 for Bravehearts Inc. An amazing effort by an amazing woman dedicated to helping make Australia the safest place in the world to raise children. You can buy this tee in sizes 1-10 for kids in the Little Pinwheel online store. Thank you Hayley for all your hard work! And love the tee Minti! Such a cool tshirt design and a great cause! I think so too Jacq - so great.